Nov. 3, 2017 - Hampton's Emergency Management Office has a new Community Emergency Response Team class starting Jan. 4. Sign up now for four weeks of training on everything from disaster preparedness to light search and rescue. Classes will be held Tuesdays and Thursdays - Jan. 4, 9, 11, 16, 18, 23 and 25, from 6-9 p.m., with a final practice on Jan. 27 from 8 a.m.-1 p.m.
CERT training educates individuals about disaster preparedness for hazards that may impact their community, and trains them in basic disaster response skills, such as fire safety, light search and rescue, team organization, and disaster medical operations. Using training learned in the classroom and during exercises, CERT volunteers can assist others in their community following a disaster when professional responders may not be immediately available. 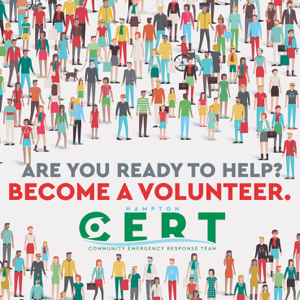 CERT volunteers are also encouraged to support emergency response agencies by taking an active role in emergency preparedness projects. Get a certificate of completion when classes are over. Email emoffice@hampton.gov or call 757-727-1208 to register or learn more.